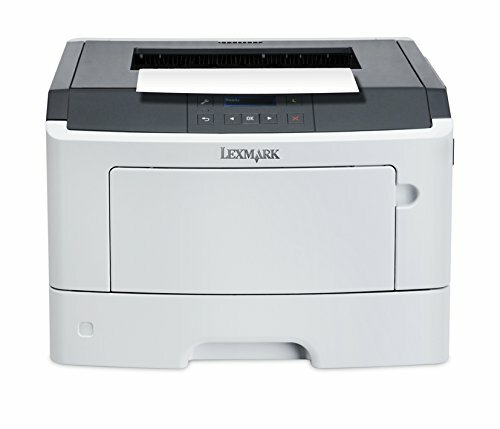 The Lexmark MS312dn offers value and performance typical of higher-priced printers. This model features duplex printing, instant warm-up fuser, display panel, Ethernet, USB and parallel ports, plus options for wireless printing and higher input capacity. Effortlessly print documents containing heavy graphics and images with 128 MB of memory, a powerful 800 MHz dual-core processor and high-speed connectivity. Experience less wait time with print speeds up to 35 pages per minute, plus an instant warm-up fuser that prints your first page in as little as 6.5 seconds. The MS312dn's two-line text LCD will not only assist in device configuration but will also keep you informed of your printer's print job status. A comprehensive set of enterprise-class network security features and protocols are built in to protect your device, your information and your network from unauthorized access. 10/100 Ethernet instantly connects to standard networks, while USB 2.0 and parallel ports link to individual device outputs. Default-mode integrated two-sided printing (duplexing) feature saves paper. With resolution up to true 1200 x 1200 dpi, images and graphics stay crisp. Lexmark's Unison Toner system optimizes printer performance, delivering rich blacks and smooth greys from the first print to the last, without fading. The MS312dn is Air Print-compatible for easy wireless output from Apple OS X and iOS devices. Lexmark backs up the MS312dn to give you maximum uptime and reduce service worries. The standard one-year warranty includes multiple contact options, including a toll-free phone number 1-800-395-4039, email, live chat and remote assistance. And if you ever need device replacement, our "advance exchange" service quickly gets you printing again. Kindly refer the user manual given below troubleshooting steps.